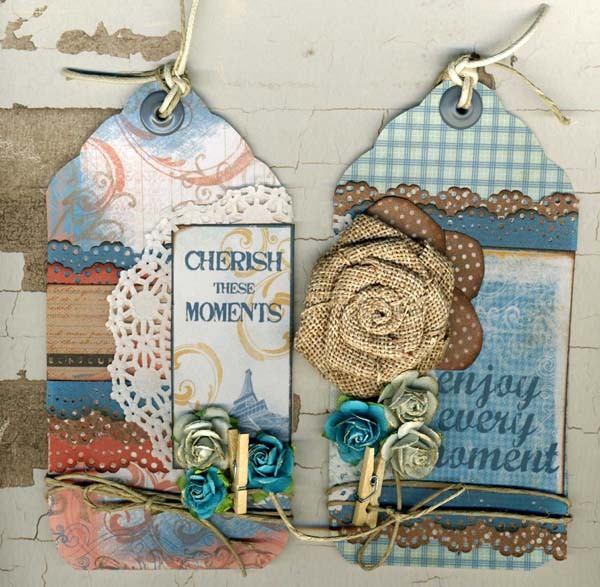 Blog Quick Quotes: Off the Page Inspiration with Lynn! Off the Page Inspiration with Lynn! Well Good Morning Everyone! Lynn here all the way from Canada to host the blog for you today! Now that Spring has Sprung I hope your all having a wonderful day! This morning I would love to share some tags I made using the Stowaway 6x6 Paper Pad and some of the PowderPuff Chalking Inks. I love using the Paper Pads for layouts and cards, but they are also perfect for tags. I cut the tags out of the sheets in the Paper Pads and then used the Quotes that also came in the Pads. I punched some little borders and added some twine and flowers to give them a country look. I finished them off with some Mocha Mama PowderPuff Chalking Ink. If you're doing some projects with the 6x6 pads, make sure you share them with us on our Facebook Page or you can link them up right here on the blog on the lower right! I would love to see them. Lynn, these tags are gorgeous! The burlap flowers goes so nicely with this line!